The application is supportive of migrating bulk emails from PST file format into PST. This implies that suppose you want to export bulk emails in enterprise then this application is worth to use. Just install the application and this will make a swift move of email data. One of the finest features in the software is maintaining folder hierarchy of the PST emails. This incredible feature allows users to access email folder into same hierarchical order which in turn gives all comfort in the long run. This also saves time and energy as well. The application is designed in such a way that even a technical person can utilize the software with ease. The simple to use features will migrate data from PST into MSG. The functioning of this application is really worth for those who posses lesser technical skills. This multi-talented software solution works on date range feature. According to this feature, users need to choose to date range from and to and this will lead to migrate data easily into MSG file format. This feature definitely saves time and help in seeking only those emails that user wants rather than converting complete email data. Does Sysessential for PST to MSG Converter converts damaged PST files too? What is the distinction between Free demo run and Fully Operable mode? Explain all about date range feature? The date range feature is beneficial when you want to migrate only few emails rather than converting all. You can choose the date range by using To and From and this will convert emails from predefined time period and predefined time. Users can select the required or specific emails for migrating into MSG file format. Is it possible for non-techie person to run the tool effectively as technical person do? What is the system requirement for migrating PST files into MSG? Software smoothly runs on all Windows editions such as Windows 2008, Windows 8, Windows Vista, Windows 10, Windows 7, Windows XP, 2003, 2000, NT and 98. What are the Outlook versions software supports? The application supports working with all the Outlook editions such as Outlook 97, 200, 2002, 2003, 2007, 2010 and so on. Hence, no matter which Outlook edition you are working on, the tool supports working swiftly with all. Is this application reliable to work on? The application is really simple and gives easy results. You can invest in the application anytime you time because it simply migrate data and cause no troubles such as virus attacks on data. You can rely on its functioning completely. 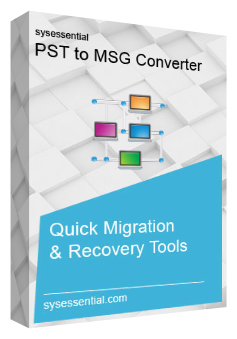 If you are unable to use convert PST files into MSG then choosing Sysessential PST to MSG Converter will simply migrate the data and render fulfilling results. I invested in this application and so happy with the attained solutions. Just like me, you try out functioning prior making investment and seek the fruitful results later. I liked its date range option which has migrated all the emails all the desired emails into MSG file. Sometimes all emails are important to move into new file format. One of my friends called me yesterday and discussed about the plight of manually conversion of PST to MSG conversion. This leads us to perch for some established tool such as Sysessential PST to MSG Converter. He is so happy with the attained solutions. It moved away all the emails safely into MSG file format from PST files. The application supported working with all the Outlook editions, which is another plus point of the tool.